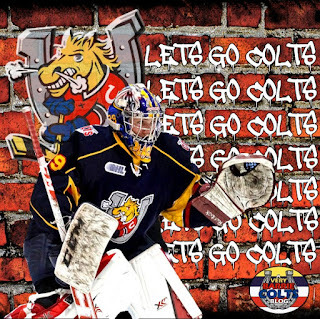 Barrie Colts goalie Mackenzie Blackwood invited to Hockey Canada final selection camp. #WJC #OHL - Very Barrie Colts | A website covering the Barrie Colts of the OHL. This morning Hockey Canada has announced their final selection camp headed into this years World Junior Championship which is set to begin on December 26th, 2015 in Helsinki, Finland. It is no surprise that Barrie Colts goaltender Mackenzie Blackwood was announced as one of the goalies set to participate in this years camp and with only 2 goalies getting the invite it is safe to assume Team Canada is confident that he is at least one of two goalies who will be on the team. The New Jersey Devils prospect (who was drafted in the 2nd round at #42) has been unreal for the Colts this season with a 16-7-0-0 record. His 2.39 GAA is the second best in the OHL currently while his .930 save percentage is the leagues best. Blackwood also currently has 2 shut outs on the season. Those who follow the Colts know that being first in the Central Division would not be possible without having Mackenzie playing as well as he has been this season. If you want to see the rest of the list announced by Hockey Canada, here is the full list of invites. Congratulations to Mac and best of luck!